1. Add shredded chicken, cheese, beans, and half the El Sol salsa together in a mixing bowl and mix until well combined. Season with salt and pepper to your liking. 2. Heap 2 spoonfuls of the chicken mixture onto the center of an egg roll wrapper. Gently fold in the sides and roll the egg roll up like a burrito. Seal the edge with a dap of water. Set aside and repeat until the filling is gone. 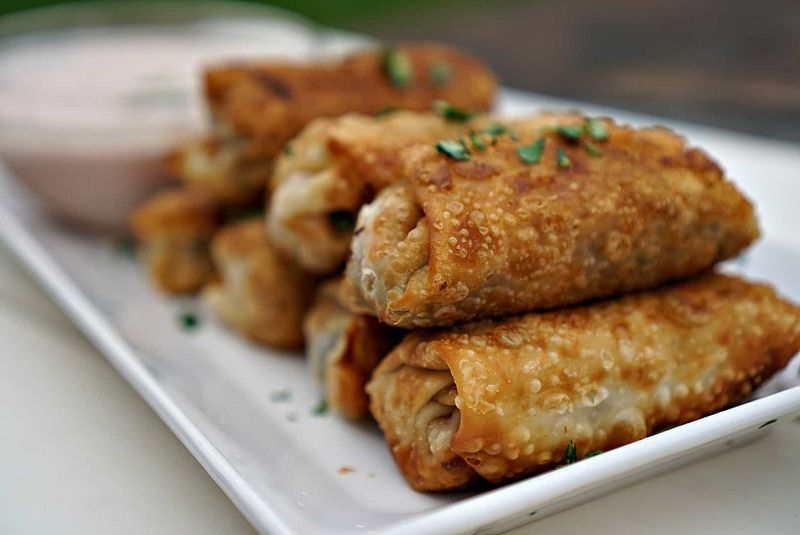 You should have about a dozen egg rolls. 3. Heat the cooking oil in a frying pan and add the egg rolls to the hot oil. Fry over medium high heat for about 1-2 minutes on each side, until egg roll is crisp and golden brown. Place on paper towel lined plate until all egg rolls are cooked. 4. Mix the remainder of the salsa with the sour cream, lime juice and cilantro. Season with salt and pepper to your liking. Mix well. 5. Serve the hot egg rolls with the creamy salsa dip.